Viking is the most award winning river cruise line. Each Viking itinerary is created with your destination in mind, highlighting culture, history, and geography. Enjoy an intimate look at the world's rivers and oceans when you sail with Viking. 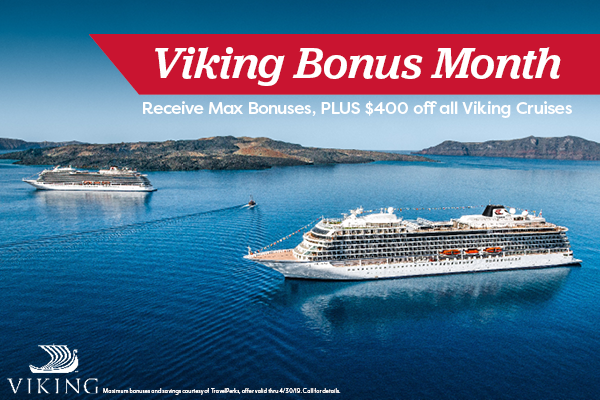 Maximum bonuses, PLUS $400 Off all Viking Cruises courtesy of TravelPerks - all month long! Celebrity Cruises provides their guests with a uniquely elegant and curated adventure. Its fleet of ships is at the forefront of ship design. The award-winning staff delivers an elevated experience to guests onboard and onshore. With sailings around the world, including the only year-round Galapagos Islands itinerary, Celebrity strives to achieve a higher standard in cruising. 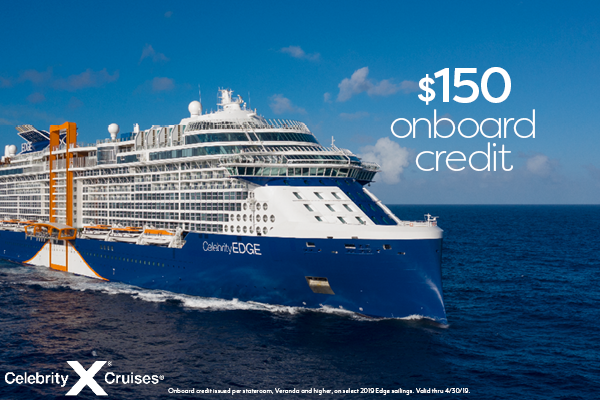 $150 onboard credit now on select itineraries. 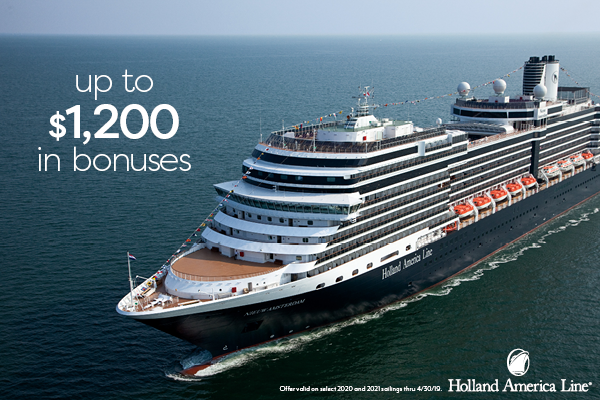 Holland America is a cruise line with a 145-year history, known for their smaller yet premium fleet. Onboard you’ll experience legendary service and world class entertainment. With more than 500 sailings per year, visiting all seven continents, there is an itinerary for everyone! Save up to $1,200 on select itineraries and rooms. Princess Cruises started in 1965 with a single ship. Now, Princess boasts a fleet of 18 ships sailing to almost 400 destinations around the world. The Princess Cruises staff delivers an immersive vacation, catering to each guest onboard. Experience true relaxation onboard a Princess Cruise! 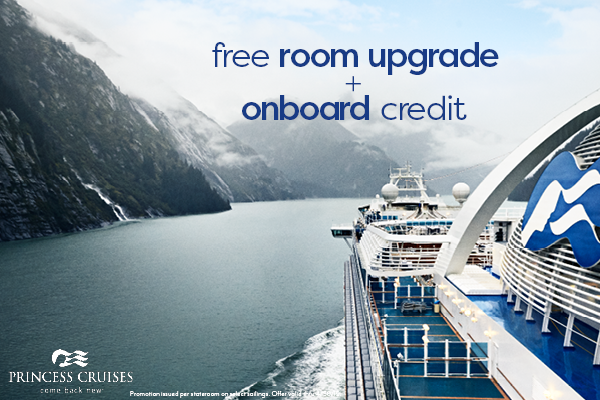 Free room upgrade and onboard credit now on select itineraries. Royal Caribbean Cruise Line is known for driving innovation at sea and continues to redefine cruising since its launch in 1969. Each successive class of ships is an architectural marvel and pushes the envelope of what is possible onboard. Royal Caribbean has debuted several industry “firsts” – such as rock climbing, ice skating, and surfing at sea – capturing the imagination of all. Guests experience Royal Caribbean’s friendly and engaging service while visiting some of the world’s most popular destinations. 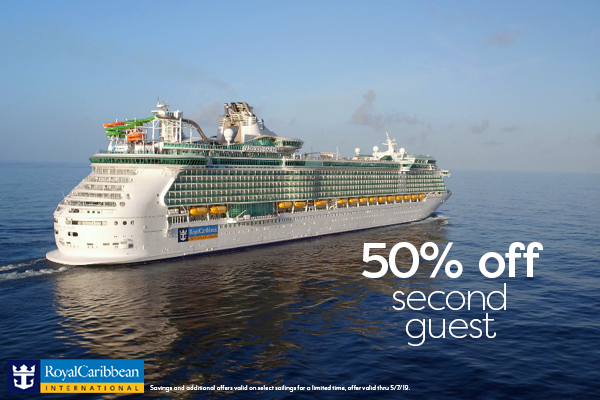 Buy One Guest, get Second Guest Fare 50% off + Kids Sail FREE (on select itineraries). Since 1972, Carnival has been delivering fun vacations for all! There is no shortage of entertainment onboard or ashore when you sail with Carnival. Enjoy a live show or take the plunge down a water slide! "Choose Fun" when you choose Carnival Cruise Line. 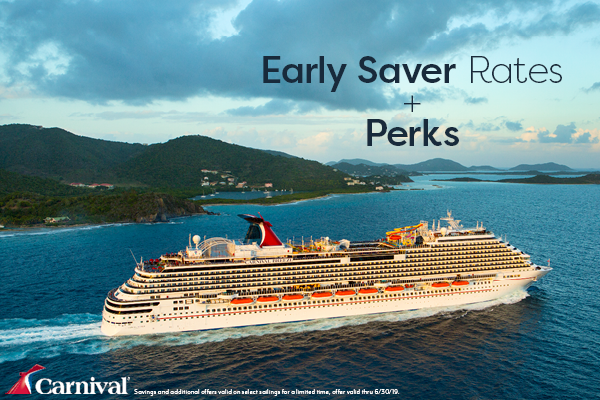 Choose Your Perk: Early Saver + up to $50 Onboard Credit or Early Saver, Room Upgrade, + 50% Reduced Deposit. Crystal Cruises is true luxury at sea. With small yacht-like ships, Crystal is known for their state-of-the-art ships offering legendary service, space, quality and choices. Begin your day by waking up in your own private suite, complete with personalized butler service and all-inclusive amenities. With multiple voyages and itineraries for each destination, the world is your oyster with Crystal Cruises. 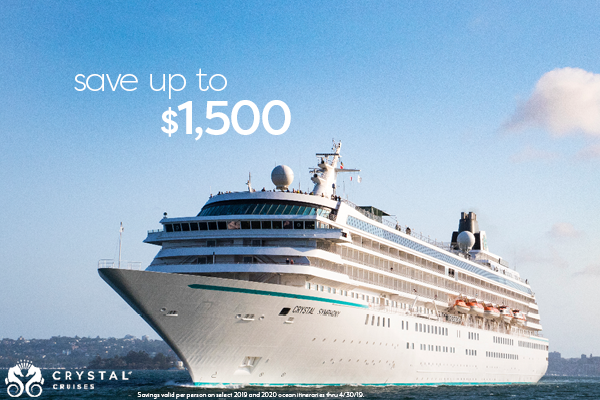 Save up to $1500 now on select itineraries. No schedules. No stipulations. Just award-winning entertainment and diverse dining options from the only cruise line built for versatile vacationing. Enjoy the most inclusive contemporary cruise vacations with Norwegian. With one-of-a-kind onboard experiences like a race track at sea, an idyllic private island with white sand beaches and plenty to do, and itineraries exclusive to Norwegian, we’ll take you places in ways no other cruise line can. 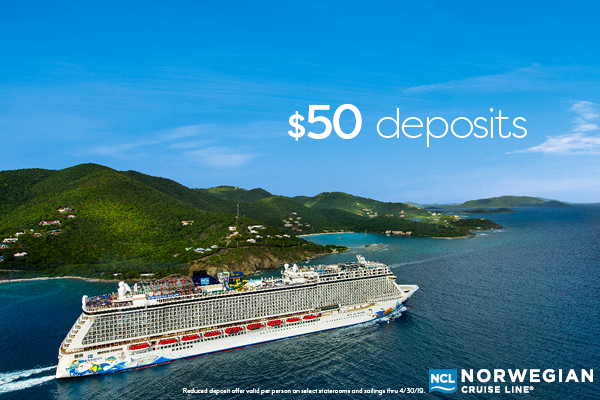 $50 deposits now will hold your dream vacation for less. All above offers are based on cruise line regulations, where applicable, and subject to change. Speak with a vacation specialist for details. Price reductions, adjustments, and changes to a booking after initial deposit make all benefits subject to reduction and/or elimination at the sole discretion of TravelPerks Dream Vacations. All terms, conditions, and benefits can be changed at any time, without notice. Contact your Vacation Specialist for any further questions or clarification. "Everything worked out even better than planned. On all three shore excursions we met people in the bus who said they appreciated those excursions and they were far better than the ones offered by the ship. We, too, were impressed with the quality of the excursions and tour guides. The cruise was spectacular and all the arrangements made in advance were spectacular." "Appreciated the desire and willingness to do whatever it took to make our trip memorable. There are always things that can't be helped [flight delays] but it was easy to see the effort put into making the experience special." 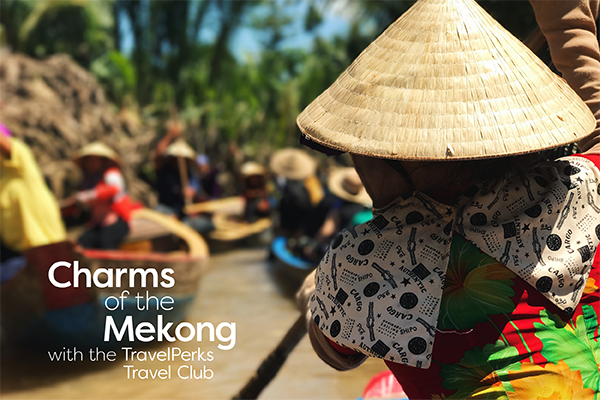 "TravelPerks provides us their unique personal touch on all of our cruises to make it successful"
"Words can not explain the marvelous time we had on our very first cruise. Theresa is the Best Travel Agent!! There was not a time when I called with questions that my questions went unanswered. Great Customer Service, Very Caring Travel Agents, always there to help, great prices, and last but not least I'm ready to go again!!!! Looking forward to Cruising in the near future!!. Again Thanks Theresa for all of ur help. If anybody ever needs a Travel Agent this company will be the only one that I would recommend."